Andreas Scholl first sang the music of J. S. Bach as a boy chorister. 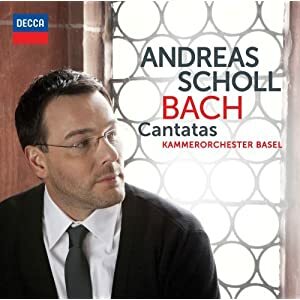 Now the German countertenor returns to his musical roots with his own selection of arias from Bach’s Cantatas on an album to be released on Decca on October 11th, 2011. The countertenor of reference follows up his much-praised Purcell collection O Solitude with a project perfectly matched to his artistry and musical heritage. The Kammerorchester Basel led by Julia Schröder joins Scholl. Included on the album is Cantata BWV 82, “Ich habe genug,” composed for the Feast of the Purification in 1727 for bass soloist, and subsequently performed by mezzo soprano in the same key and by soprano in E minor. It is scored for strings and oboe, whose plaintive tone matches the somber tone of the text: The infant Jesus is brought to the Temple for blessing and the aged Simeon pronounces the text that survives 2000 years later in Catholic, Anglican (and no doubt other) evening services: “Lord, now you are letting your servant depart in peace.” BWV 200, “Bekennen will ich seinen Namen”, a single aria with two violins and continuo, dates from the early 1740s and was perhaps also written for the Purification. Cantata BWV 169, “Gott soll allein mein Herze haben”, was first performed in 1726, and relates to the theme of that Sunday: “Love your God with all your heart, soul and mind, and love your neighbor as yourself.” Cantata BWV 53, “Schlage doch, gewünschte Stunde”, despite being one of the better-known cantatas, is probably by Georg Melchior Hoffmann (ca. 1679–1715). It is a single aria, scored for strings with two bells sounding a knell, memorable and powerful, irrespective of who wrote it. BWV 161 no. 4, “Der Schluss ist schon gemacht” (1716), is a powerful recitative, scored for two recorders (symbols of death) as well as strings, from the Cantata “Komm, du süße Todesstunde”. It is based on the Gospel of Luke, chapter 7, which describes how Jesus raised a young man from death. This album also contains the instrumental introduction to Cantata BWV 150, “Nach dir, Herr, verlanget mich”, one of Bach’s earliest sacred works.